At English Studio we want you to enjoy learning English as much as we enjoy teaching it! So we make sure the English we teach you in our classes is relevant, useful and fun to learn. We teach to a high standard and our courses are accredited by the British Council and ACELS to name but a few. Across our London and Dublin language schools we have been teaching English for over 20 years. During that time we have helped more than 60,000 students in their English language learning. It’s what we love to do and we look forward to helping you too. Explore our range of courses below or contact us today for more information – we’ll be happy to help. Our London language school is located directly opposite Holborn Tube station in the heart of this incredible city. 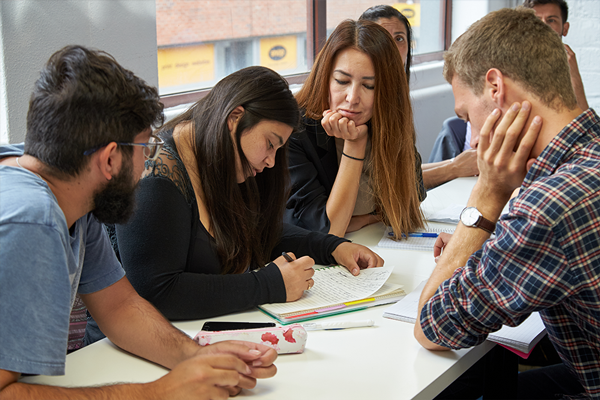 You can choose from a wide range of courses including General English, Intensive English, IELTS, English for Work and preparation for the Cambridge CAE. English Studio Dublin has a fantastic location in the middle of Ireland’s capital city. Temple Bar is just a few minutes walk away as are all the other top attractions. We offer a selection of English courses in Dublin including General English, Intensive English and IELTS, and we also run Trinity Certificate TESOL courses for anyone looking for a career in teacher training. All our courses are specially designed to make the most of learning English in two of the greatest cities in the world. You will learn English fast with our imaginative lessons and friendly teachers. Plus your class will be structured to give you the maximum time to practice. For more information contact us today or take our English Quiz to see what level you are right now. Teaching English is a delicate balance of skill, intuition, careful planning and empathy. It requires patient, smart and experienced people to do it well. And these are the type of people that will teach you at The English Studio. Our courses are based on practical English that you can use everyday. Conversation and speaking are the focus with lots of grammar & writing practice. When you study with us we give you a language for life. Want to hear more from us? Sign up for our Newsletter.